The feel and look is very high quality.delivery was fast and on time. Courteous delivery guys as well. I love my new furniture. It’s perfect! I Definitely would recommend this furniture to anyone And tell them to shop at Raymour and Flanigan. Love this piece. Excellent construction and so comfortable. My mother has The three piece version (chaise, loveseat and cuddled) and has had it for nearly ten years and still in great condition. 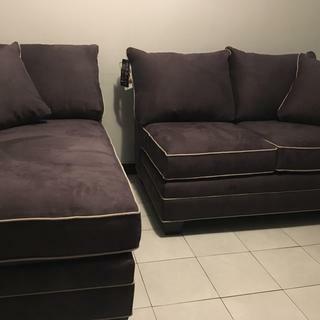 The 2-piece sectional is firm, comfortable, and beautiful. I recommend this sectional; it would enhance your livingroom too. This 2-sectional is firm and comfortable; and adds such beauty to any small livingroom space. Comfort is great, either sitting or reclining. Can fit 4 easily. Plenty of room. . Style is very adaptable and easy on the eye. Platinum plan ensures 5 year warranty. Does show sand, etc. A bit easily than other material. A solid buy. Do the back cushions detach? BEST ANSWER: Yes. The back cushions are loose. What size door does this fit through? BEST ANSWER: The Foresthill 2-pc. Microfiber Sectional Sofa will fit through a 28" doorway. Does this layout/option have a sleeper sofa option? If so, what sizes? BEST ANSWER: Although this particular listing does not include a sleeper option, we will be happy to assist you in assembling your own configuration that does include a sleeper. For assistance, please call 866-383-4484, option 3. Is this part of or similar to the Briarwood collection ? BEST ANSWER: The Foresthill is similar to the Briarwood collection. It is made by the same manufacturer. BEST ANSWER: The color of the piping is actually a taupe. Does the left arm facing chaise come longer than 65 inches? BEST ANSWER: The Foresthill collection offers the 65" chaise only.